I have this old Ladies’ Home Journal cookbook that I want to sneer at, but I can’t. The recipes are well tested. The photography is mouthwatering. The recipes are for dishes I want to make. Sorry for doubting you, Ladies’ Home Journal. You had some great food editors back in the ’90s. Clearly you’re not working at Midwest Living, which suggested I make blueberry muffins by mixing my freshly picked Michigan blueberries into my favorite cake mix batter. Go ahead, call me a food snob. Within the covers of this cookbook is a recipe for a cake that is perfectly August, bursting with ripe fruit but hinting at fall with its spices and nuts. Three layers of tender, bourbon-laced pecan cake are stacked with mounds of ripe nectarines and clouds of whipped cream. You need a crowd for this beauty, because it won’t keep for another day (though I’m not above finishing off that final slice after the party, cake layers slumped into a puddle of juicy fruit and melted cream). Bake the cake layers the night before, wrap them well, and slice the nectarines just before dinner so they have time to release their juices. After dinner, take 10 minutes to whip the cream and assemble the cake, then hurry back to your celebration. Heat oven to 350 degrees F. Line three 9-inch round cake pans with parchment or waxed paper and coat with baking spray or grease and flour. Grind pecans in a food processor or blender until finely ground. Mix pecans, flour, baking soda, nutmeg, cinnamon and salt in a large bowl. Stir buttermilk and bourbon together in a measuring cup. Beat the butter and sugars together at medium-high speed until light and fluffy, about 4 minutes. Add the egg yolks, one at a time, beating well after each. Reduce the speed to low and stir in half the flour mixture, then the buttermilk mixture, and finally the rest of the flour mixture. Beat just until smooth. In a clean mixing bowl with the whisk attachment, beat the egg whites on medium-high until they just hold stiff peaks. Gently fold the egg whites into the batter with a large rubber spatula. Divide the batter and spread it evenly into the cake pans. Bake for 20-25 minutes, or until the tops are golden and a toothpick inserted in the center of the layers comes out clean. Cool the layers in the pans on a wire rack for 15 minutes; then remove from pans and cool completely. 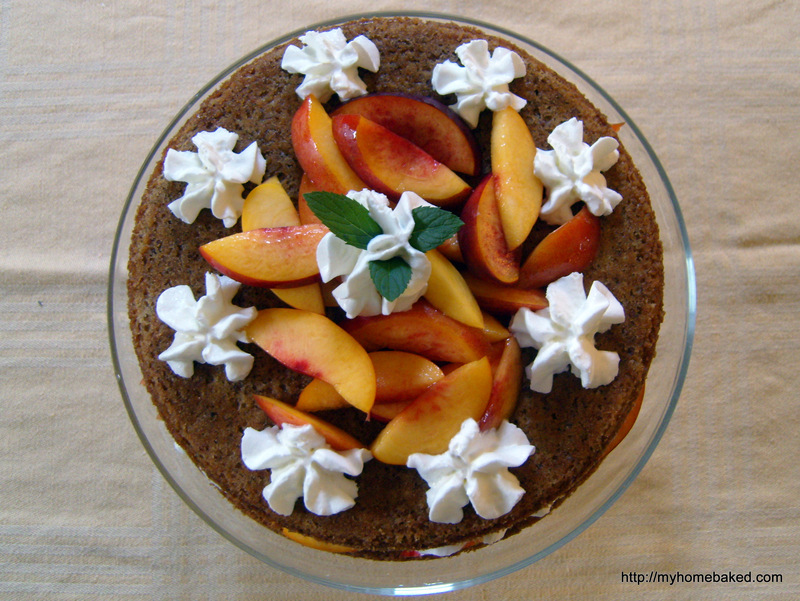 To assemble the cake, place one layer on a serving plate and cover with a single layer of nectarine slices. Spread one-third of the whipped cream over the nectarines. Top with the second cake layer and repeat. 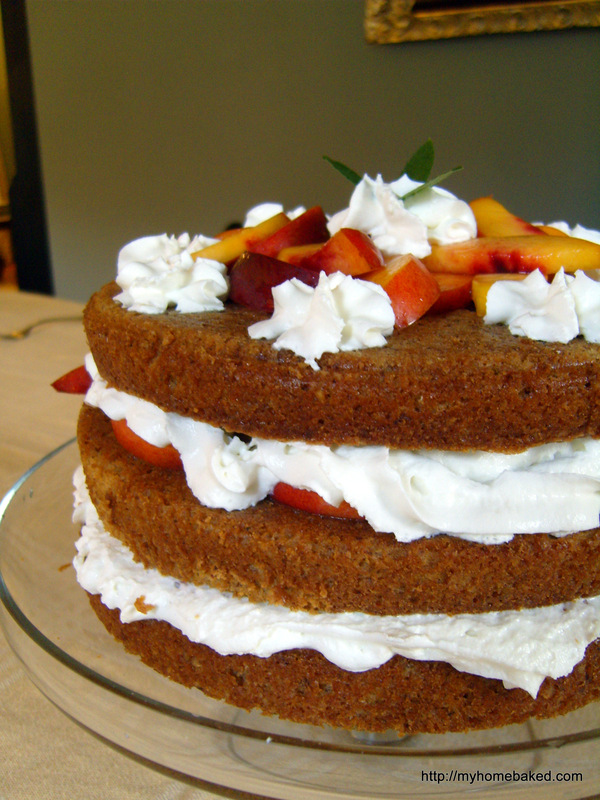 Add the final cake layer, the remaining whipped cream, and garnish with the remaining nectarines. Refrigerate for up to 3 hours. 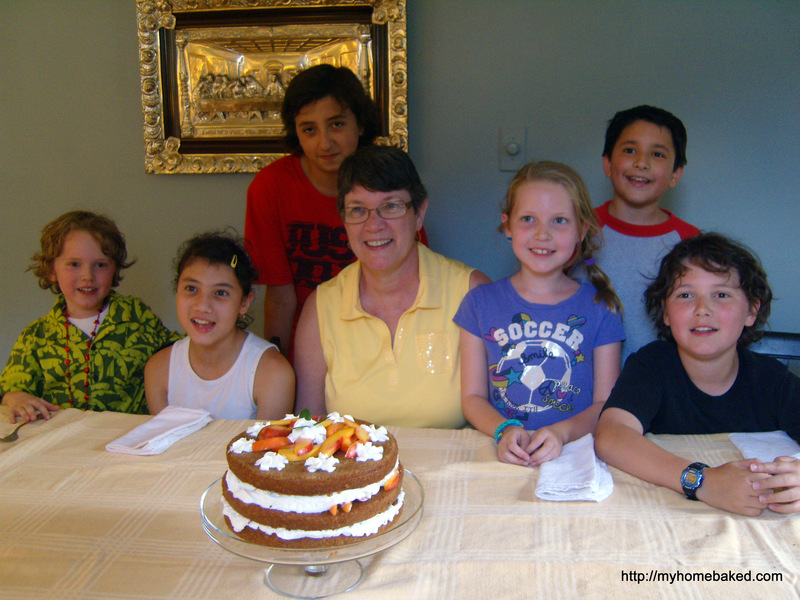 Enough birthday cake for Mom and all her grandchildren!